UNM-Gallup now offers students interested in the field of nursing the option of receiving a Bachelor of Science in Nursing. The addition of the bachelor’s degree is the result of collaborative statewide partnerships that allows institutions of higher education to share a common curriculum and grant students access to a broader number of program options. UNM-Gallup previously offered only an on-site Associate Degree in Nursing, but now allows students to fulfill additional requirements for the BSN without having to leave the UNM-Gallup campus. BSN students who complete the program will receive their Bachelor of Science in Nursing from the University of New Mexico main campus in Albuquerque, and their Associate of Science in Nursing from UNM-Gallup. Students seeking the BSN will have to complete nursing program admission requirements from a range of prerequisites including science, English, math and humanities before they are eligible to enter into nursing coursework. Once the prerequisites are finished, however, completion of the BSN only requires one more semester than the ADN. The UNM-Gallup nursing program has 24 spaces available each semester – eight for the BSN and 16 for the ADN. The BSN entrants must have all prerequisites completed with a 2.75 grade point average and pass an admissions exam. Nursing Program Director Sabrina Ezzell explained several advantages to completion of the bachelor’s program. “Graduates have a higher earning potential with the BSN. Additionally, many federal facilities, such as the Veterans Affairs Department, are now requiring a BSN," Ezzell said. She went on to recognize the high placement rate of UNM-G nursing graduates. “UNM-Gallup has a 100-percent hiring rate with many students offered jobs even before they have taken the state boards. Most graduates stay within an hour of the area accepting employment in Gallup, Grants and Ft. Defiance.” she said. This BSN partnership with the UNM main campus is the result of the New Mexico Nursing Education Consortium’s common statewide nursing curriculum. This shared curriculum was designed and is shared by 15 programs throughout the state. Students can seamlessly transfer between institutions that have adopted the NMNEC curriculum for both ADN and BSN programs. All NMNEC schools have the same admission requirements, program policies and course requirements. The process undertaken by UNM-G to integrate the BSN included faculty adoption of the curriculum and assignment of a mentoring school, which was San Juan College in Farmington. 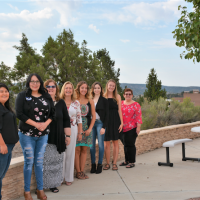 Administrators from the San Juan College nursing program presented to the UNM-Gallup nursing faculty to share information and make recommendations in areas where additional coursework was needed especially in prerequisite areas such as neurobiology. 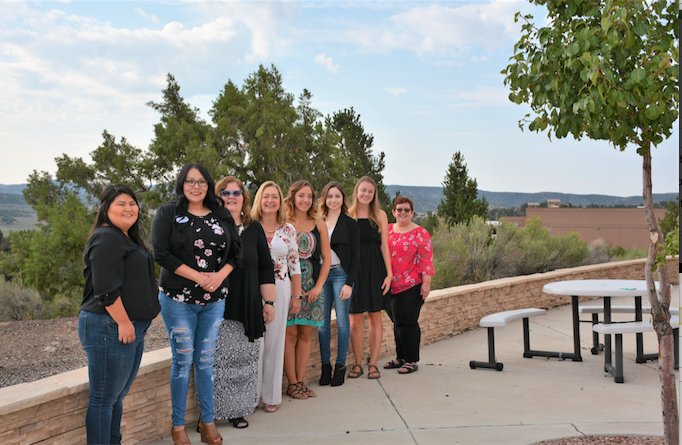 The first group of BSN students started this fall and participated in an orientation with UNM-Gallup faculty as well as Judy Liesveld, education team chair and Susan Koronkiewicz, undergraduate program director from the UNM College of Nursing.